Whether you’re planning a move in the near future and require a space in which to store your furniture before you make the transition, or you’re moving your business offices, self-storage units can provide the ideal solution during the move. But beyond their initial function, self-storage units are now offering significant value as real estate assets. Investors across the globe are now reviewing the potential of buying a self-storage unit for its potential future sales value. In this article, our experts highlight what to look for when investing in a self-storage unit. What’s around the facility in the local area? This is an important question to consider when making the investment. Supply and demand dictates that businesses must have a significant local marketplace to ensure investors receive a full return for their investment funds. Look for storage facilities close to growing neighborhoods. Are there several larger competitors in the region offering similar services? If so, you’re unlikely to see a short-term return for your investment in a storage unit. It’s also important to consider the location of the business. Can a new competitor overtake the brand within that location? The storage facility should be positioned as the leader within the marketplace and have a high potential for future growth. When buying a storage unit, you’re not simply making a one-time transaction. You’ll often be responsible for maintaining the unit. And you’ll have to take time to consider the potential marketing value for the company and its units. It requires comprehensive research that many are unwilling to complete. Does the company value security highly? Do they employ video camera technology to detect intruders and capture images of the area around the facility? 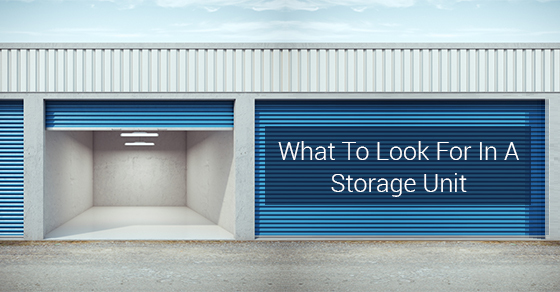 These are leading considerations storage unit users will make when using a self-storage facility, so they should be top of your mind when you look at a potential facility for investment. Speak with the in-house team and analyze their current security infrastructure. You’ll quickly be able to identify companies for whom security is not a priority. By completing comprehensive market research and speaking directly with specialists in the storage industry, you can locate high value investment opportunities in the self-storage market. To learn more on this topic, speak with our expert team today.